A lack of funding and “finite resources” in mental healthcare across Lincolnshire is adding pressure onto crisis services and affecting quality of care. According to a report, which has been backed by senior councillors and health bosses, more awareness training for staff and a review of investment is required to support those in critical need. 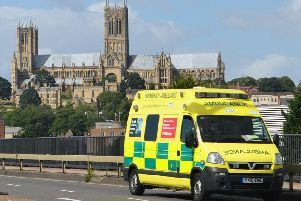 An increase in costs of transferring patients outside the county and “excessive use of police resources” sparked the review into urgent mental health services. The report was commissioned by a multi-agency group which included Lincolnshire County Council, Lincolnshire Partnership Foundation NHS Trust, Lincolnshire Police and local CCGs. It said that there is “widespread recognition” that services are doing their best despite limited resources. Cabinet member for NHS liaison at the county council, Councillor Sue Woolley, backed the report and said the work had been a “long time coming”. She added that she hoped “sufficient” funding will now be spent in the right areas. “It’s likely that a review of funding needs to be looked at,” she said. “I think that because of the piece of work that has been done, there is probably an opportunity to ‘sweat the pound’ a bit more. The purpose of the review was to give a “clear picture” of current mental health services in the county. As a result, the review recommended how future care could be commissioned. It found that the amount of services provided to working age adults outnumbered that available to young people and children. It also said that there was “a lack of communication and collaboration between services”. The report made recommendations such as awareness training for staff, services working together and reviewing the crisis and homecare teams in the county. Further investment would be required in services to carry out the findings, it added. Ian Jerams, director of operations at Lincolnshire Partnership NHS Foundations Trust, said he agreed with all the recommendations made. “As a key member of the group, LPFT was fully engaged in the preparation of the report,” he said. “We agree with all of the findings and wholeheartedly support the recommendations which aim to improve mental health crisis services. “The key challenge for Lincolnshire is working together across health, social care and the criminal justice system to ensure these recommendations are taken forward for the benefit of local people. LPFT have since secured £700,000 in funding from the Department for Health and Social Care for crisis support. Projects include a new urgent mental health care hub at the Peter Hodgkinson Centre in Lincoln.